Monograph on Carum carvi L.
Monograph on Premna serratifolia Linn. Monograph on Eugenia jambolana. Lam. Diabetes and hypertension are two of the most prevalent chronic diseases in the world. According to the 2012 World Health Organization’s statistics report, one in three adults worldwide has raised blood pressure while one in ten adults have diabetes. Prof. Mohamed Eddouks has crafted a book entitled “Phytotherapy in the Management of Diabetes and Hypertension”, bringing out a timely volume with contributors from several continents. Following the success of Volume 1, various aspects of these two prevalent diseases are discussed in the second volume. A number of topics are covered in 11 chapters, including a comprehensive overview on the herbal pharmacotherapy of hypertension, an overview on the new approaches for the treatment of diabetes and hypertension using herbal medicines; combating diabetes with indigenous medicinal plants. In addition to the overviews, there are nine chapters focusing on specific herbs and plants for the prevention and treatment of these chronic diseases, including some Chinese medicines, curcumin, silymarin, caraway (Carum carvi L.), Premna serratifolia Linn. (Arani), Eugenia jambolana. Lam., Coccinia indica Wight and plants belonging to the genus Senna. With the advance in technologies, more in-depth understanding on the pathogenesis of the diseases and more robust investigations on phytomedicine, I envision that phytotherapy will play an important role in the management of diabetes and hypertension. This book would be a treasure for the field; it gathers traditional wisdoms, contemporary experimental studies and clinical trials for quite a number of promising phytomedicines for the prevention and treatment of these prevalent chronic diseases. This is an e-book published by Bentham Science Publishers, which is different from the traditional concept of hard or soft cover book. This approach will make the book more easily accessible to a wider section of readers. It is a great pleasure on my part to pen a foreword for this nice, multiauthored, international publication on a topic very close to my heart. I profoundly wish the editor a great success and will look forward to see more Volumes culminating from this beginning. I also extend my sincere thanks to all the contributors for their excellent efforts in making this book a good reference for the readers. 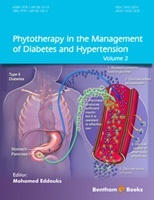 The book “Phytotherapy in the Management of Diabetes and Hypertension, Volume 1”, co-edited by Prof Mohamed EDDOUKS & Prof Deprasad CHATTOPADHYAY and published by Bentham Science Publishers (2013) has been considered as a good addition in the existing knowledge of hyperglycemia and diabetes as well as their management. The volume 1 of this book series has emphasized the basic Biochemistry for diabetes mellitus and hypertension, and described every aspect of these lifestyle diseases and its control or remediation through a cost effective, safe, easygoing, easy-adaptable method through the age-old practice validated by scientific research. The volume 1 has been successfully indexed in Scopus database. In response to requests from WHO in providing safe and effective herbal medicines for use in national health-care systems and to prepare monographs of used medicinal plants around the world, the present volume 2 of this ebook series contain monographs related to antihypertensive and antidiabetic plants. Each monograph of antihypertensive and antidiabetic plants contains actualized scientific information about the pharmacopoeial data for quality assurance: botanical features, distribution, identity tests, purity requirements, chemical assays, active or major chemical constituents, clinical applications, pharmacology, contraindications, warnings, precautions, potential adverse reactions, and posology dealing with various aspects of diabetes and hypertension. Especially, the mechanisms of action involved in the antidiabetic and antihypertensive effects, the active phytochemicals and the clinical trials performed for these medicinal plants are deeply discussed. As the phytotherapy can give long term benefit with less or no side effect, hence this e-Book series can be treated as authenticated alternative or complementary therapeutic compendium to the physicians and patients. This volume includes 11 chapters showing at the first section the background related to the pathophysiology as well as treatment of diabetes and hypertension, while the second section shows the role of phytotherapy in the management of diabetes and hypertension. Especially, monographs on some important antidiabetic and antihypertensive plants are presented. This book series will be useful to the students, teachers, researchers, naturopathist, scientists, clinicians and even the common people interested to know about the subject. I would like to express my great appreciation to the contributors, Dr D. Chattopadhyay for his contribution to the first volume of this book series, Prof V. De Feo for supporting the publication of this volume, Prof W. Cho for his nice foreword and Bentham Science Publishers for giving me the opportunity to publish this book series in my favourite field of interest. The Editor would like to express his thanks to the contributors and the CNRST, Morocco. This work was supported by the CNRST under grant N° PPR/2015/35.